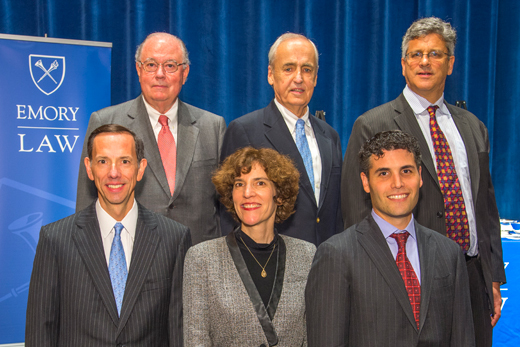 Emory Law Dean Robert A. Schapiro (bottom, left) poses with Emory Law Alumni Award recipients (top, left to right) C. Lash Harrison, William J. Carney, Reuben Guttman, (bottom, left to right) Sharon A. Israel and Thad Kodish. Photo by Tony Benner Photography. Four alumni and one beloved professor received top honors on Friday, Sept. 25, as Emory Law hosted its annual Alumni Awards. During the event at Gambrell Hall, Reuben A. Guttman 85L received the Alumni Service Award for significant, sustained leadership and outstanding service to the Emory Law community. Reuben Guttman is a partner at Guttman Buschner in Washington, D.C.
As part of a U.S. State Department program in conjunction with Emory Law’s Center for Advocacy and Dispute Resolution, he has been one of five visiting professors at Universidad Panamericana in Mexico City training Mexican judges and practitioners on oral advocacy and trial practice. The Distinguished Alumni Award is given to a graduate who embodies the values of the school and has demonstrated extraordinary achievement in the legal profession and in service to society. C. Lash Harrison 62B 65L received that honor this year. Harrison has more than 45 years of experience representing management in all aspects of employment and labor law. Since Ford & Harrison’s inception in 1978 with 14 lawyers, Harrison has served as its managing partner. Ford & Harrison is now one of the largest labor and employment law firms in the United States, with nearly 200 attorneys. The Young Alumni Award went to Thad C. Kodish 00L, managing principal of Fish & Richardson’s Atlanta office. This award recognizes the professional and personal achievements of alumni who graduated within the past 15 years and have made notable leadership and service contributions to Emory Law and to the legal profession. Kodish currently serves as the past president of the Emory Law Alumni Board, sits on the board of directors for Conexx – the America Israel Business Connector and has been active with the Atlanta Intellectual Property Inn of Court. The Eléonore Raoul Greene Trailblazer Award commemorates Greene 20L, the first woman admitted to Emory University and a national leader in the women’s suffrage movement. It is given to an Emory Law alumna who has blazed a trail for others through her own professional and personal endeavors. The 2015 recipient is Sharon A. Israel 90B 90L, partner with Mayer Brown LLP. Israel is a frequent speaker on patent-related topics and serves in leadership roles in numerous organizations, including currently serving as president of the American Intellectual Property Law Association. Special faculty recognition was given to William J. Carney, Charles Howard Candler Professor of Law Emeritus. Carney is a well-known author, lecturer and teacher in corporate law. He served as chair of the Corporate Code Revision Committee and as a member of the Executive Committee of the Cor­porate Section of the State Bar of Georgia. He is a board member and chair of the Nomination and Governance Committee of Pharmasset Inc., a NASDAQ-listed company. Carney led the committee that developed the Center for Transactional Law and Practice in 2007 and hired its first director. Carney and his wife, Jane, recently donated a $1 million challenge grant to help the center hire an assistant director and to enhance both its experiential programs and academic offerings.